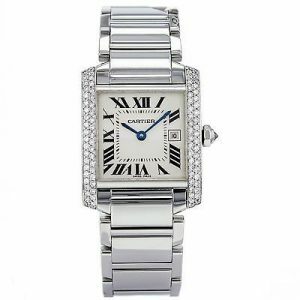 Born in 1917, the Cartier Tank opened its legend with a bold and innovative rectangle watch case. The case and the strap are utterly integrated, and the compact lines create precise shapes. 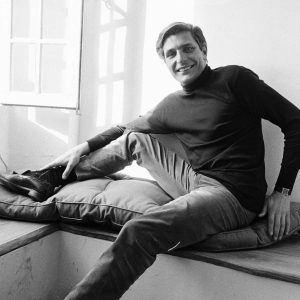 Their free spirit and elegance make it not only a popular design, but also the darling of every generation of celebrities. 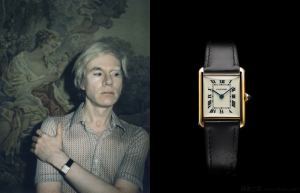 In 1994, Jean-Charles de Castelbajac autographed a picture of a Cartier Tank watch and wrote the sentence“If all the tanks are made by Cartier, we should have enjoyed world peace and lived a carefree life!”on Figaro Madame to pay highly tribute to the classic watch. According to the blueprint of the Renault Tank during the First World War, the lugs on both sides represent the track, and the case represents the tank cockpit. So far it has been for a hundred years in the watch industry. With the occasion of the celebration of the 100th anniversary of the Tank series in 2017, let us give you a complete review of the timelessness of this timepiece. 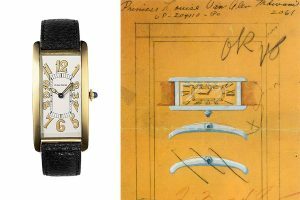 Experienced watch experts and the writer Franco Cologni appraised Louis-François Cartier, “Louis Cartier focused on the fusion of aesthetics and modernity. 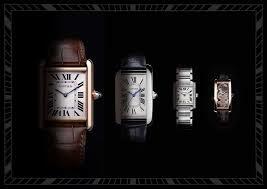 Put these two words aside, we can not understand the beginning of Cartier watches”. 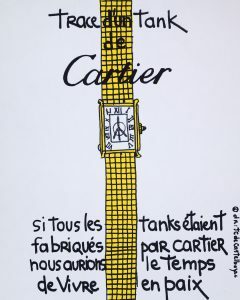 Although France was at war in 1917, I believe that he still embraced these two words calmly when when Mr. Cartier created the first Tank watch, or the Tank watch wouldn’t be loved by people in a century. 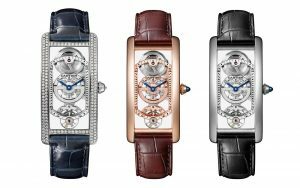 If we say that the Santos watch opened the chapters and let Cartier watch brand be born in the watch history, then the advent of the Tank watch laid a solid foundation for Cartier, making Cartier watch collection grow in strength. In the second half of 1916, the World War I settled into the stalemate. Louis Cartier was particularly concerned about the battle of the Somme and shocked by heroic deeds. He learned that new armored vehicles have been applied to the war in September and the war won victory time and again. He saw the armored vehicle-Le Tank from the L’Illustration. 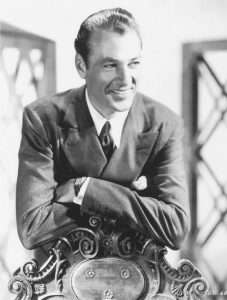 Hence, the Tank collection was inspired by it. With his keen intuition and the pursuit of aesthetics and technology, Louis finally created the TANK watch in 1917 and established his undoubted lofty status in the history of watchmaking. The Tank built a unique style among the rounded watch cases. 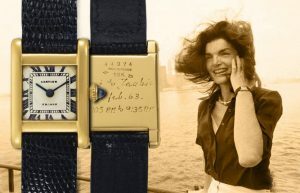 The brand gifted several of the first Tank wristwatches to the General John Pershing and his subordinate officers after the victory of the World War I. The biggest reason why the Tank keeps its high status is that it is a masterpiece of all the classic elements in one: radial Roman numeral hour markers, blued-steel hands, track-shaped minute scale, vertical lugs, beaded crown set with a sapphire cabochon. So far, the Tank has had six members: Tank Louis Cartier (Born in 1922), Tank Américane (Born in 1989), Tank Française (Born in 1996), Tank Solo (Born in 2004), Tank Anglaise (Born in 2012) and Tank MC (Born in 2013). 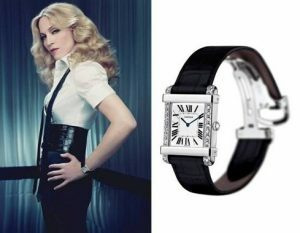 Tank Cartier watch is regarded as a chic symbol by Gary Cooper, Andy Warhol, Madona, Catherine Deneuve and so on. It has been well known for simple style and harmonious lines since its birth. People prefer its unique style to its symbolic status. 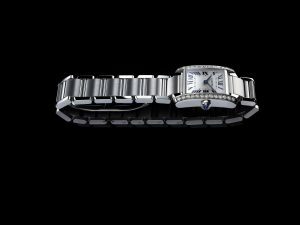 Four New Cartier TANK Series Reveal the Combination of Classic Elements and Creative Designs. With the advent of 20th century, Louis Cartier, who has a rich cultural deposit and loves collecting, developed jewelry design daringly and explored new artistic styles. Cartier jewelry pieces which featured geometrical lines and abstract art was launched in 1904. Full of pioneering spirit and bold exploration, Cartier used the avant-garde modern style to announce the birth of Art déco. Meanwhile the watchmaking business played a more and more critical parts in all Cartier Projects. Louis Cartier launched wristwatches in the year, making the brand attract much attention in the watchmaking industry. 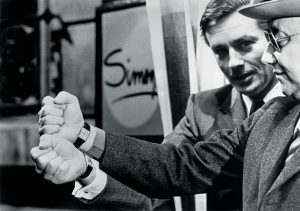 In that time, the wristwatch appearance was mainly focused on round cases and dials, while Louis Cartier aimed to build a wristwatch with unique style. Finally, Tank Cartier watch was released in 1917, leaving an indelible mark in watchmaking history. 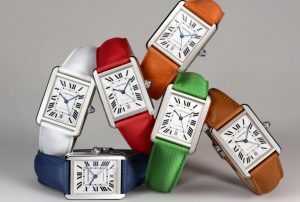 Inspired by tanks, Tank Cartier watch featured straight lugs and a rectangle case. 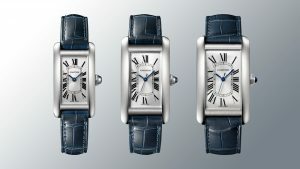 Most of Tank Cartier watches displays Roman numerals hour markers and the track scales as the iconic features. The rectangle case and straight lugs succeeded in obtaining a harmonious counterbalance, reflecting avant-garde style. 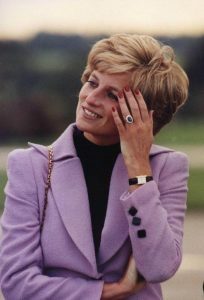 The crown was decorated with a sapphire cabochon. With freedom spirit, graceful style and perfect proportion, Tank Cartier watch is popular with both men and women, revealing modern style. 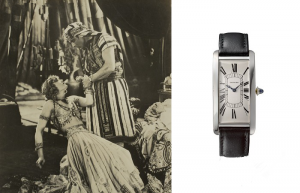 To this day, Cartier Tank has a long history of hundred years. For people who respect freedom spirit in each era, Cartier Tank is the embodiment of good taste and elegance, connecting the past to the present. 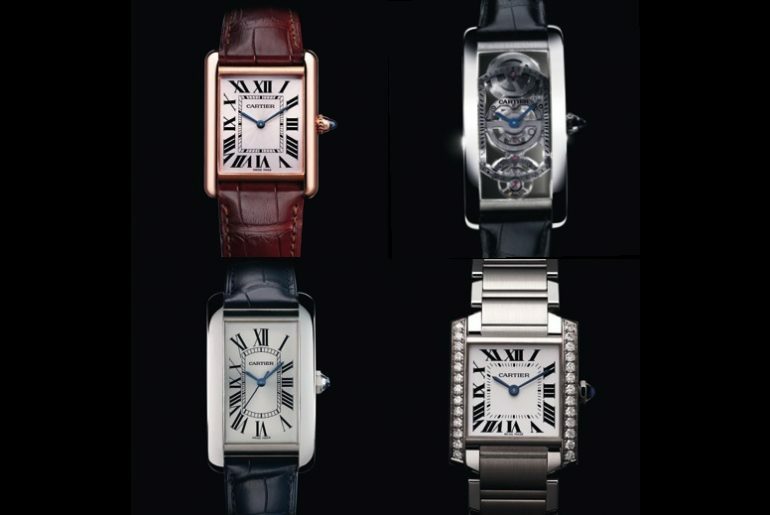 Three classics of Cartier Tank series guide a modern life style: Tank Américaine watch, Tank Française watch, Tank Louis Cartier watch. 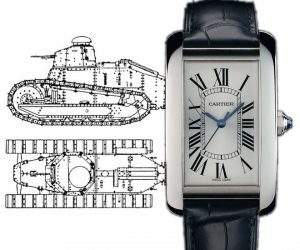 In honour of the 1921’s excellent work, Cartier combined with high-end watchmaking craftsmanship to create Tank Cintrée watch. TANK Américaine watch reveals geometrical aesthetics perfectly, neat and soft, straight and curving, rounded and clean-cut. New TANK Américaine watch reflects the spirit of the original TANK watch with simple but modern style. Simple lines, high end steel and the precious alligator leather strap make the TANK Américaine watch be the focus around the wrists, showing a true modern style. Born in 1996, TANK Française watch bore the modified features – improved lugs, Roman numerals, minute track scales, sword hands and a cabochon crown. The link bracelet and the cambered case blend into one harmonious whole. Perfect craftsmanship stands out soft lines. With practical functions and unique style, the watch in steel and diamonds brings out distinctive charm. TANK Louis Cartier watch made its debut in 1922. With straight lugs, rounded edges and the fusion of lugs and the case, TANK Louis Cartier used its iconic features to show the real spirit of a TANK watch. The eye catching look and distinctive style reveal pure and lasting charm. New TANK Louis Cartier in rose gold and white gold with diamonds is available. Both the two models are equipped with Cal. 8971 MC, a manual mechanical movement. 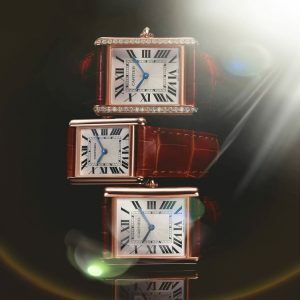 Square case or rectangle case, Cartier chose the latter as the image of the first TANK watch. The cambered case is just suitable for wrists. Bold exploration in function and style laid the foundation of TANK Américaine watch in 1980. The models in rose gold and platinum are crafted with the cambered case and a skeleton movement-Cal. 9917 MC, a manual mechanical movement. Through simple design, the TANK Cintrée watch reveals classic features: blue steel hands, minute track scales and delicate gears. Indelible aesthetics and the outstanding movement help the watch be a classic masterpiece. New TANK Cintrée watch is limited of only 100 pieces.